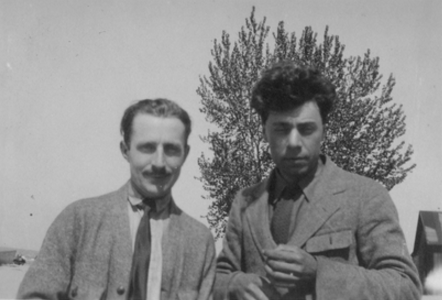 Barry Byrne and Alfonso Iannelli, Indiana Dunes, ca. 1918. Byrne Family Collection cited in Michael, Vincent L., "Expressing the Modern: Barry Byrne in 1920s Europe," Journal of the Society of Architectural Historians, Vol. 69, No. 4 (December 2010), p. 535). I have always wondered how Galka Scheyer fatefully made her way to the doorstep of the Schindler House during the summer of 1925. Just now rereading her first dispatch to the "Blue Four" after arriving in San Francisco with her travel companion Gela Archipenko I made the startling discovery that former Frank Lloyd Wright disciple Barry Byrne was almost certainly the connection. "A twelve-hour day in stifling heat to Chicago. Chicago, another sort of fairy tale city like New York. There we found the architect Barry Byrne, Feininger's friend, who, starting with the lake, gave us a twilight tour by car of the city. The building facades, illuminated by spotlight, rose up like magical flowers into the infinite space, blending together with the stars and the moon, and Schey-Penko's hearts sang with joy. On the other day Chicago baked, until we were dizzy, as if we had been drinking wine. And our liveliness increased. Poor Barry Byrne, our exuberance made him quite shy. We spent the entire day like a couple of teenage girls, riding around Chicago, which resembled a huge park, looking at everything of architectural interest, above all Frank Lloyd Wright and Barry Byrne's work. The predominantly horizontal lines and flattened proportions make Wright's buildings especially effective. But very original. Byrne's work is assertive in its lines, very delicate and sacred. For me, new notes in American architecture. (I have 10 slides of his architectural work.) Countless, unexpected EI Grecos in the museum." (Galka Scheyer, collective letter to Blue Four, Sacramento, 21 July 1925, Galka Scheyer and the Blue Four Correspondence, 1924-1945 edited by Isabel Wunsche, Benteli, 2006, p. 91). Galka and Gela's introduction to Byrne came via one of her "Blue Four," American Lyonel Feininger who was teaching at the Bauhaus when Byrne and Iannelli visited in July of 1924. This was coincidentally just a few months after Scheyer had signed a contract with Feininger, Jawlensky, Klee and Kandinsky at the Bauhaus establishing the "free group of the blue four ... for the purpose of disseminating their artistic ideas abroad, particularly by means of lectures and exhibitions." (Wunsche, p. 32). During their two days together Scheyer would have mentioned her plans to go to Los Angeles and Byrne would have shared any contacts in Los Angeles that he had. Byrne had spent 1913 in Los Angeles trying to establish a practice while sharing an apartment with Lloyd and John Wright who were then working for Irving Gill and Harrison Albright respectively. It was during this period that Byrne and the Wrights became lifelong friends with sculptor Alfonso Iannelli. (For much more on the Byrne, Wright, Iannelli Los Angeles friendship see my "Irving Gill, Homer Laughlin and the Beginnings of ModernArchitecture in Los Angeles, Part II, 1911-1916"). "... In Europe [Wright is] without question the most highly-ranked American architect. - I am very happy that Mr. Byrne gave you such a nice reception! He was charming when he was here; I would like to see him again and get to know him better! Likewise his friend, Janelli [sic], the sculptor." (Feininger to Scheyer, August 19, 1925, Wunsche, pp. 100-1). Bauhaus, Weimar, Henry van de Velde, architect. From Internet. 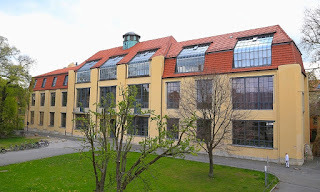 We visited the art school at Weimar and saw the classes and studios. It is entirely modernist—full equipped with all necessary machinery and design is accompanied by execution which the pupils do—carrying out their own designs. Splendid atmosphere in the place. Student body earnest—cheerful and working. Alfonso, thinking of the Art Institute’s classes, inwardly groaned. German people are allowing it and I’m for them ... The trip has benefited me tremendously and I am becoming clear as to the way I want to work which was one thing I wanted to settle. I’m commencing to be keen to get back at the job." (Barry Byrne to Annette Cremin, July 6, 1924. Byrne Family Collection cited in Michael, Vincent L., "Expressing the Modern: Barry Byrne in 1920s Europe," Journal of the Society of Architectural Historians, Vol. 69, No. 4 (December 2010),pp. 534-555). Lyonel Feininger, ca. 1926. From Internet. 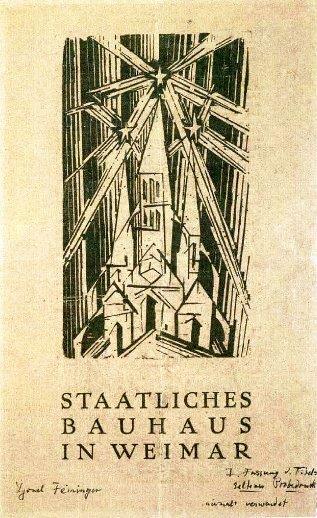 "Cathedral" by Lyonel Feininger, "Staatliches Bauhaus in Weimar," 1919. Walter Gropius appointed Feininger as one of the first Bauhaus masters in May 1919, where he directed the printing workshop from 1919 to 1925. 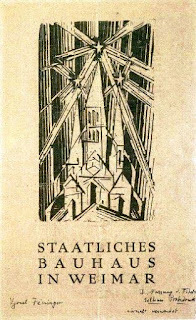 His woodcut "Cathedral" (see above) was used to illustrate the cover of the Bauhaus Manifesto of 1919. In 1921, a folder with 12 woodcuts by Feininger was the first publication to be printed at the Bauhaus Weimar. (Ibid). Byrne and Iannelli continued to Berlin where they met Mies van der Rohe. "We were taken about by a Mr. Mies van der Rohe (all one name) an architect belonging to the constructivist group - the most modern of the modern architects & art movements. ... Van der Rohe proved to be a great friend before we left Berlin - a large powerful reposeful person - spoke no English but we got on famously - a distinctive and powerful personality. Mr. and Mrs. Mendelsohn also took us in hand and showed us things we wanted very much to see. We had a delightful evening with them - dinner, etc. He is one of the extraordinary talents among the architects, his work leaves me gasping—I am—or rather my work—very conservative when shown alongside some of these men. Mrs. Mendelsohn a beautiful woman. They both expect to come—or go—to America this fall." (Byrne to Cremin, June 17, 1924, Michael, p. 541). 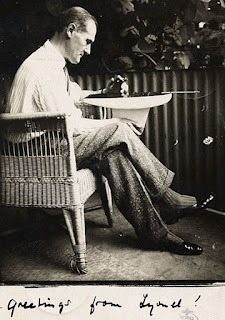 Besides absorbing much valuable inspiration Byrne forged important connections and friendships with Feininger, J. J. P. Oud, Mies van der Rohe, Erich Mendelsohn, Laszlo Moholy-Nagy and others evidenced by later correspondence. (See Michael, footnotes). For example, only a few months after Byrne's return to Chicago Mendelsohn arrived during a tour of America's major cities. Like he would with Scheyer the following summer, Byrne hosted Mendelsohn, driving him around for the better part of two days scouting for interesting buildings to include in his upcoming book Amerika (see below). 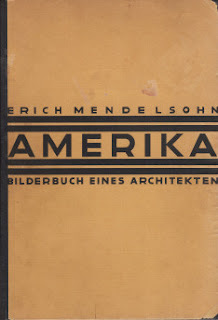 Amerika: Bilderbuch Eines Architekten by Erich Mendelsohn, Berlin, Rudolf Mosse, 1926. 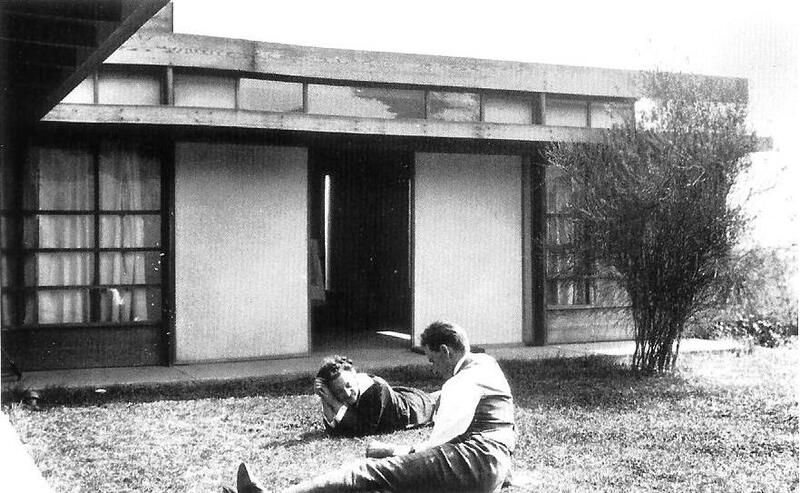 Mendelsohn continued to Taliesin to meet Wright and reunite with his recent associate Richard Neutra (see below). Mendelsohn’s letters home claimed he was the first European to visit Wright and the latter’s work was by far the highlight of his trip. (Michael, note 46, p. 553 and Erich Mendelsohn, Letters of an Architect (London: Abelard-Schuman, 1967). From top to bottom, Kameki and Nobu Tsuchiura, Silva and Werner Moser, Frank Lloyd Wright, Erich Mendelsohn and Richard Neutra, Taliesin, November 1924. Photo possibly by Dione Neutra. Author's note: Seen in the above picture, the Tsuchiura's and Mosers had recently been in Los Angeles, the former working on Wright's Millard, Ennis, Storer and Freeman Houses with Byrne's and Iannelli's close friend Lloyd Wright and the latter had visited the Schindlers at their new Kings Road House (see below). In a few short months the Neutras would be on their fateful way to Los Angeles to join the Schindlers. (For much more on Neutra's time at Taliesin see my "R. M. Schindler, Richard Neutra and Louis Sullivan's 'Kindergarten Chats'"). Schindler and Werner Moser at Kings Road, April, 1924. Courtesy Archive of Werner Moser, Eigenossische Technische Hochschule Zurich, from Sweeney, Robert, "Life at Kings Road: As It Was," in The Architecture of R. M. Schindler edited by Elizabeth A. T. Smith and Michael Darling, Museum of Contemporary Art, Los Angeles, 2001, p. 96). Getting back to Scheyer, after a year long unsuccessful struggle to gain a foothold in New York she decided to try the West Coast. Scheyer had befriended Russian sculptor Alexander Archipenko and his wife Gela who had preceded her to New York by one year. After her "Blue Four" membership offer to Archipenko was rebuffed, Scheyer, accompanied by Archipenko's wife Gela, left New York for California on May 30, 1925. They first made their way to Chicago where, as mentioned earlier, they looked up Feininger's contact Barry Byrne. It was next to Ames, Iowa for a "Blue Four" lecture then on to Denver, Colorado Springs and Santa Fe. As it did for Schindler 10 years earlier, Santa Fe completely enthralled Scheyer and she would return on numerous occasions over the ensuing years. 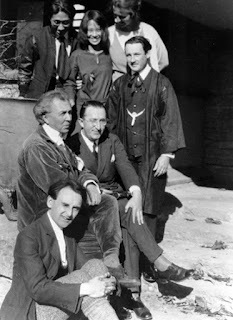 (For much on Schindler's formative 1915 visit to Taos and Santa Fe see my "Edward Weston and Mabel Dodge Luhan Remember D. H. Lawrenceand Selected Carmel-Taos Connections"). Gela Archipenko and Galka Scheyer at the Grand Canyon, July 1925. From Wunsche, p. 104. 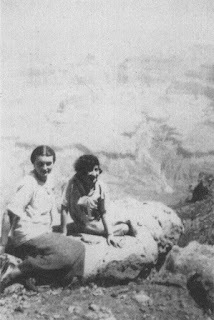 The ladies then camped for two nights at the Grand Canyon. 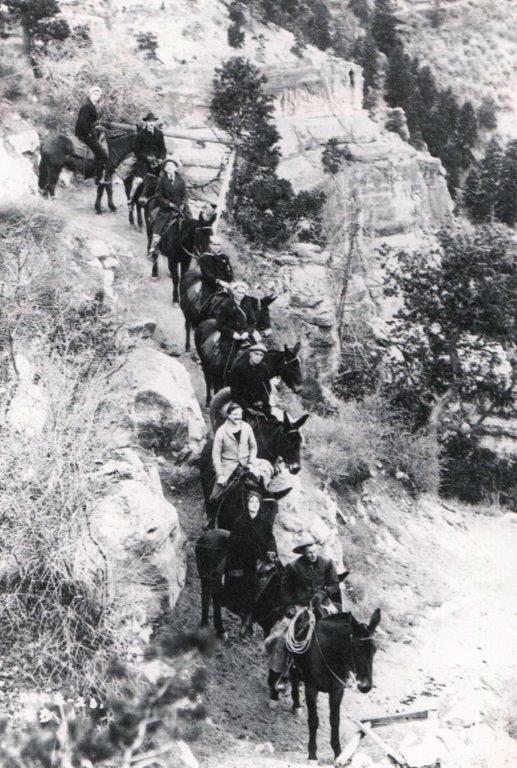 "We approached the Grand Canyon by moonlight. Again, a wide, flat land. A high plateau. Like the belly of the earth, with a gaping wound, the ground splits open to reveal her entrails. Silent, gruesome, dead. The moonlight slips down and the shadows cloak the endlessness, the depths, which man is not meant to see. We slept in tent lodges and froze (7000 feet elevation). In the brilliant morning light the gorge revealed itself. Six thousand feet deep, an immense 217 miles long, 13 miles wide. We wanted to leave at once. Why? Unexplainable. It was too beautiful, too colorful, at the same time, too dead. From the most delicate pink to the most burning red. Horizontal layers of earth, like the piled up tombs of kings in a strange, sunken world. Too romantic. Like wedding cakes, too sublime, the layers splendidly arranged ... A drop of eternal beauty, bearing within it silent death. Unanswered signs of the millennia, piled-up graves, of petrified, wordless questions of coming and going. Farewell - Schey-Penkos both decided, away from here ... Like a miracle, the smallest bird in the world, no larger than a baby's finger, balanced on the edge of the cruel gorge and, miraculously, often standing still in the air. It must be resting on a sunbeam. Who knows the name of the smallest bird in the world, which rests upon a sunbeam? In the evening, the Indians of the Hopi tribe began the dances of their warriors. Real Indians, wonderfully flexible and lithe in their movement. Their weavings, paintings and painted wooden figures are very artistic. They live here in specific districts." (Wusche, pp. 94-95). The Schindlers, second and third from the bottom descending into the Grand Canyon, December 1920. Courtesy UC-Santa Barbara Architecture and Design Collections, Schindler Collection. The Schey-Penkos at last made it to Los Angeles for a very fruitful and prescient stopover indeed for the fledgling "Blue Four" representative. "Los Angeles on the Pacific Ocean. Thirteen-day stopover ... Many contacts on account of lectures in the fall. One for sure at the University of Los Angeles [University of California, Los Angeles]. Met, above all, architects. Bold and novel construction here. Schindler (see above and below), Neutra, students of Wright. H. Sachs (see below), more for interior design, the one who was in the Munich Arts and Crafts???? He knows everyone there. He has arranged many contacts for me. We went with the Russian general Ladischinsky, a Hollywood actor (now), to the film studio "Metro-Goldwyn-Mayer" one day and had a look behind the highly interesting scenes of the film world. The "most famous stars" play there; a world of its own. Then grand and long day trips by car into the surrounding area. Santa Monica ... along the ocean, then up to the mountains ... On account of my lectures I had to present myself in Santa Barbara, 3 hours from Los Angeles. I was supposed to possibly stay for later, at a school and an art institute. Then, only a few days after we left, they had a large earthquake there [Santa Barbara] and now everything is destroyed." (Wunsche, p. 95). 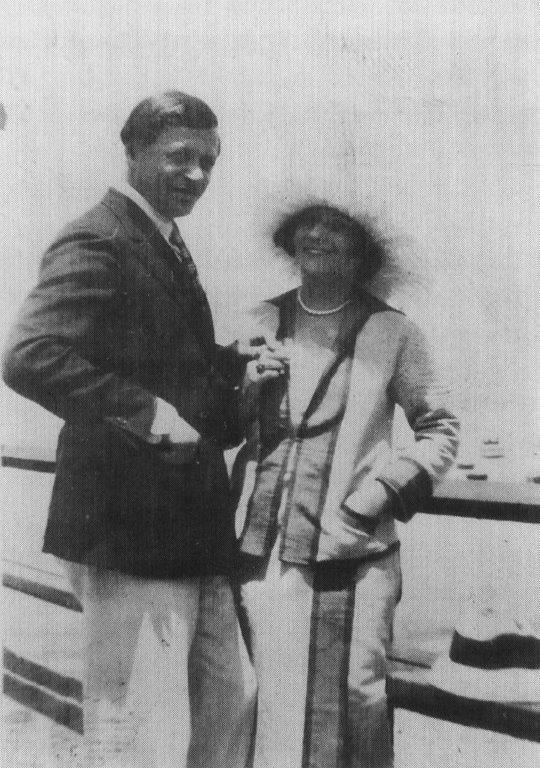 Herman Sachs and Galka Scheyer, Los Angeles, July 1925. From Wunsche, p. 104. Byrne was the one who passed on Schindler's contact info to Scheyer evidenced by a notation in her address book. Schindler in turn immediately put her in touch with Herman Sachs. Byrne and Iannelli also most likely knew Sachs through their connection to his short-lived Chicago Industrial Art School located at Jane Addams' Hull-House (see below). 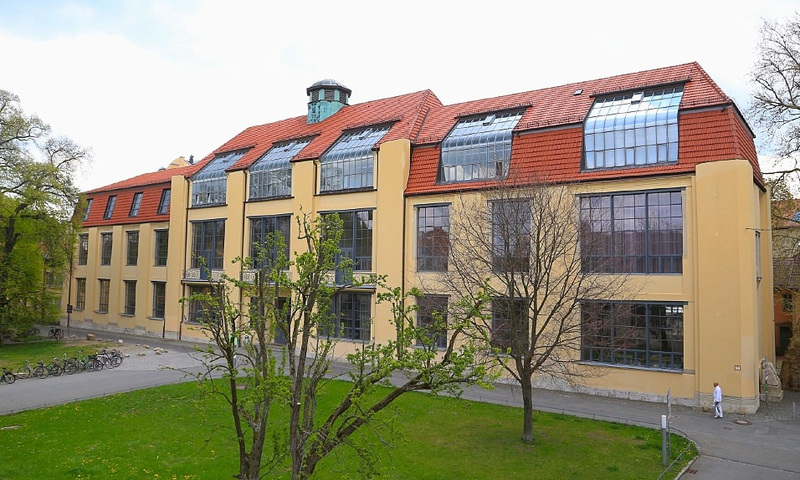 Apparently Byrne and Iannelli were slated to collaborate with Sachs in establishing Industrial Art Shops modeled after Vienna's Weiner Werkstatte and Sach's Munich Arts and Crafts School. (Alfonso Iannelli: Modern by Design by David Jameson, Top Five Books, 2013, p. 171 and my "Herman Sachs Batik, ca. 1920"). Of course connecting with Sachs would have led Scheyer directly to Schindler's Kings Road House where the Neutras had only moved in from Taliesin the previous March. Sachs had befriended the Schindlers before their December 1920 move to Los Angeles, thus it is likely that Byrne also knew Schindler by that time. 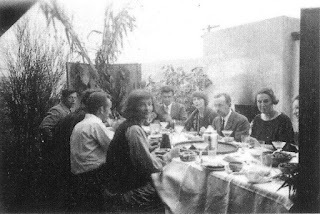 Sachs and Schindler were already collaborating on Schindler's projects by the time of the below 1923 Thanksgiving photo taken at Kings Road. Thanksgiving at Kings Road, 1923. Clockwise from left, Herman Sachs, Karl Howenstein, Edith Gutterson, Anton Martin Feller, E. Clare Schooler, unidentified, Betty Katz, Alexander R. Brandner, and obscured, Max Pons, to the right of Sachs. Courtesy UC-Santa Barbara Architecture and Design Collections, Schindler Collection. In the above photo Herman Sachs is seated at the far left across from close mutual Chicago friends and then Kings Road tenants Karl Howenstein and Edith Gutterson. Karl and Edith were both for a period of time employed at the Art Institute of Chicago and the Church School of Industrial Art where Schindler lectured on architecture and design. Thus they were also most likely known to Byrne and Iannelli. By the time of this photo Howenstein was the new Managing Director of the Otis Art Institute and would soon become Cuarator of the associated Los Angeles Museum of History, Science and Art. (Ibid.). Byrne's close friend Lloyd Wright, who was at that point still on good terms with the Schindlers, was at this time playing his cello at their weekly Kings Road salons. (For much more on the mutual Chicago friendships of the Schindlers, Karl Howenstein, Edith Gutterson and Herman Sachs see my "Herman Sachs Batik, ca. 1920"). 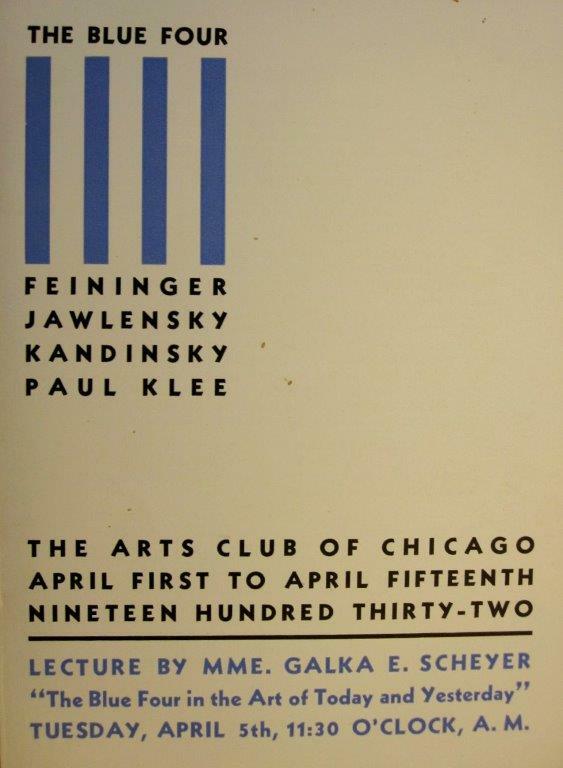 Exhibition catalogue for The Blue Four, Arts Club of Chicago, April 1 to April 15, 1932. From Getty Research Institute, Peg Weiss Papers. Scheyer undoubtedly thought she had struck gold finding such a plethora of art, architectural and design contacts in Los Angeles. It would be through the Schindlers, the Neutras, and Herman Sachs, who also happened to be the U.S. agent for German artist George Grosz, that she would build her Los Angeles foundation for "Blue Four" exhibitions and sales. 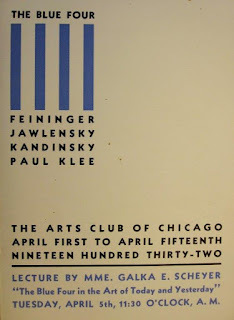 She also would certainly have reconnected and had much news to share with Barry Byrne and Alfonso Iannelli during her 1932 Blue Four exhibitions and lectures at the Art's Club of Chicago (see above) and the Renaissance Society at the University of Chicago. The Galka Scheyer saga continues in numerous other of my essays including "Pauline Gibling Schindler: Vagabond Agent for Modernism"; "Foundations of Los Angeles Modernism: Richard Neutra's Mod Squad"; "Schindlers-Westons-Kashevaroff-Cage and Their Avant-GardeRelationships"; and my work in progress "Schindler-Scheyer-Eaton-Ain: A Case Study in Adobe." For more on Byrne's formative year in Los Angeles see my "Irving Gill, Homer Laughlin and the Beginnings of Modern Architecture in Los Angeles, Part II, 1911-1916" and "Barry Byrne's Only Known Project in Los Angeles, The Brownson House Settlement Association Compound, Boyle Heights, 1913."